Cebu Pacific Promo Fares 2019 to 2020: Cebu Pacific Promo Half Fare! Cebu Pacific Promo Half Fare! Cebu Pacific Promo: HALF, HALF, Hurray! 50% off the base fare for International Flights. PISO FARE for some domestic destinations! Take note of the PISO FARE from Bacolod to CDO. Cebu To Bacolod, Dumaguete or Kalibo! Here's another #CEBseatsale for everyJuan! 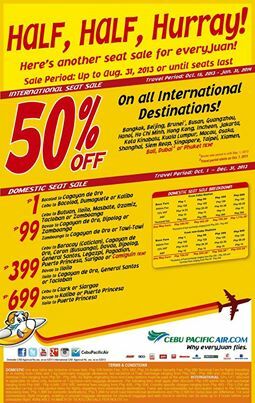 Log on to www.cebupacificair.com to see full sale details and terms and conditions! Cebu Pacific Advisory for Today!